This car really intrigues me because there doesn't seem to be much known or written about it. There is lots about the other Mercedes record cars and streamliners but only some pics and the odd bit of info about this particular one. It amazes me that in the 30's that Formula One cars were capable of 300km/h and when doing record runs over 400km/h. The drivers had no protection, or seatbelts, but deaths rarely happened even when they were thrown from the cars at phenomenal speeds. These guys were amazing. Real gentlemen and hero's. A beautful time and a very beautiful car. Here's what I found on the interweb about this car and if you could add anything please do in the comments section. This info is from " The Mercedes-Benz Racing Cars" by K. Ludvigsen, 1971. 274.4 mph for the kilometer, and 248.3 mph for the mile. (Feb. 1939 by Rudolf Caracciola). 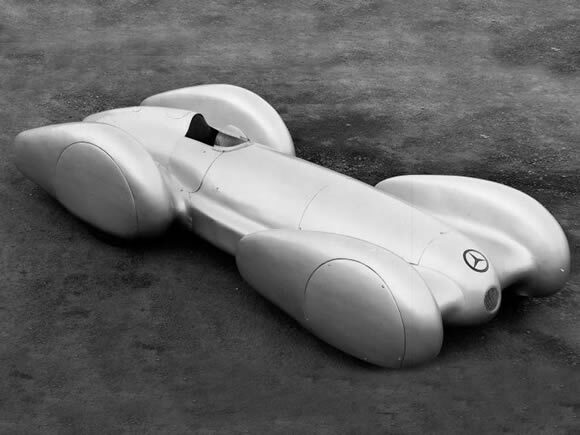 Subsequently, they went on to develop a similar W125 for the 1940 Grand Prix season, that never started. The bodywork was similar, with a Cd dropping from 0.599 to 0.293.